The Minipack MVS 45X Chamber Vacuum Sealer Machine is designed for industrial food and non-food packaging purposes. This sealing device is capable of vacuum sealing beef, fish, chicken, fruits, powders, liquids and anything else that requires vacuum sealing. Its extra large vacuum chamber measures 18.5″ x 16″ x 4.5″, providing you with plenty of allows space for packing a variety of products. Its virtually automatic function makes this machine a lot easier to operate compared to other vacuum sealing devices with manual controls. 75 inch removable aluminum seal bar. Can be used for packaging liquid and liquid rich foods. Fitted with Electronic volumetric sensor. Anyone can operate this device as it only requires selecting the vacuum amount and sealing time; placing the bag into the chamber, closing the lid and then allowing the device to do the rest. The material used in the construction of this vacuum sealer is of very high quality and this machine is manufactured in Italy. The Minipack MVS 45X Chamber Vacuum Sealer Machine retails for around $3,300. This is an industrial-strength machine that is sized to fit in your home. If you’re looking to vacuum seal large amounts of food, this is it. It’s commercial strength and priced like it. The size of the bags alone—18.5″ x 16″ x 4.5″—screams industrial capabilities. So if you’re looking to save super-sized portions for large family meals, or if you own a restaurant, this machine scores high marks in functional versatility. The Minipack MVS 45X Chamber Vacuum Sealer Machine is designed as a chamber sealer and uses Busch KB Oil Rotary pump for sucking out the air. The body of this vacuum sealer is manufactured using high grade stainless steel. The easy to use digital control with ten customizable programs and easy to read pressure indicator at the front panel allows the user to select the level of vacuum required for sealing the packages. This vacuum sealer has 17.75-inch removable seal bar. The size of vacuum chamber stands at 18.50” x 18.00” with 4.75 chamber height and 8.75 of dome height. 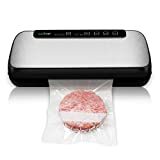 The multiple operational features associated with this vacuum sealer include programmable sealing time, programmable vacuum time, extra vacuum, excess bag cut off and high volume density plates. The display and control on the front of device includes water resistant digital display, LED display, electronic millibar sensor and customizable program setting control. The see-through plastic lid is made of high grade acrylic. The basin of this device is of seamless design which makes it very easy to clean it. The Minipack MVS 45X Chamber Vacuum Sealer is quite easy to use. Follow these instructions for a perfect seal every time. Select an appropriately sized bag. Add food or the other product which you require to seal into the bag and place the open end of the bag across the sealing bar in the vacuum chamber. Close the door and start the vacuum cycle by using control buttons. The lid of the machine will automatically open when the vacuum cycle is complete. Remove the sealed bag after the lid opens. The Minipack MVS 45X Chamber Vacuum Sealer is low maintenance. You can clean the vacuum sealer by using a damp sponge but never pour water on the machine. For hard stains, you can use mild dish soap but not abrasive cleaners. You should also check the vacuum chamber and area around the sealing bar to keep them clean and free of food debris with a clean damp cloth. Make sure to dry the machine thoroughly before using it. 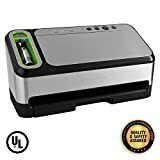 This Chamber Vacuum Sealer is recommended for the people with small businesses or small restaurants; hunters and fishermen, and chefs using the Sous Vide cooking method. You can also use it for storing large amounts of food and other household items that require vacuum sealing.